The challenge of sustaining the ecological, settlement, and economic framework of the coast is one of the Gulf South’s most pressing issues. 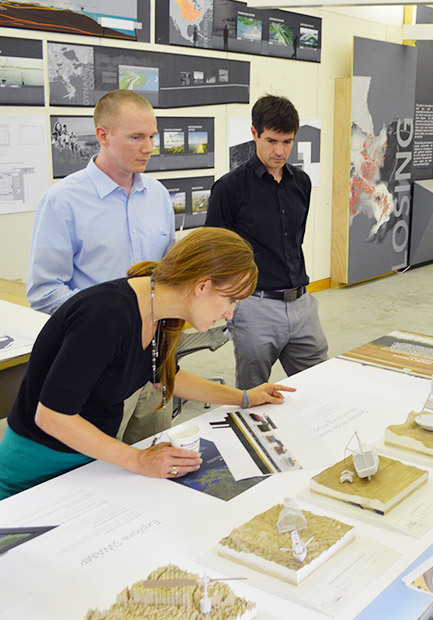 At CSS, scientists, engineers, and designers come together to intensively study and respond to issues of settlement, coastal restoration, ﬂood protection, and the economy. CSS was conceived as a laboratory to develop new strategies that reduce risk to social, economic, and natural resources. The results of this design experimentation provide a sound basis for major policy decisions for adaptation through more sustainable land-use planning, protection, and education. The CSS approach centers on supporting resilient human communities in the dynamic Gulf of Mexico environment. These communities face tremendous challenges, many of which are not being solved because the various disciplines alone cannot cope with the complexity and enormity of the problems. CSS was created as a trans-disciplinary institute for this reason. We work to envision and design sustainable systems that reduce vulnerability to increased storm strength, coastal hazards, habitat degradation, and global environmental change. Louisiana is a working coast home to two million residents who face tremendous risks including climate change, sea level rise, land subsidence, habitat degradation, marsh collapse, threat of inundation, wetlands loss, and change in rainfall patterns, to name just a few. Through our innovative, trans-disciplinary approach, CSS aims to serve as a national and worldwide model for addressing coastal sustainability. Enable new models of integrated research and design applications. CSS engages disciplines from across campus in a systems approach to solving complex coastal issues. It is essential that projects supported by the studio operate outside the boundaries of traditionally defined disciplines and lead to design products that are meaningful to a broad audience. Develop design thinking with a systems approach using performance-based methodologies. 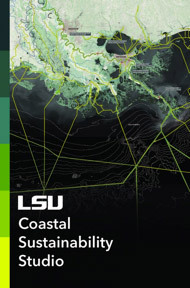 CSS projects use a hybrid of methodologies developed from design, systems ecology, and engineering to try and tackle complex problems facing coastal Louisiana. CSS projects utilize ideas from many disciplines while also embracing the concepts of sustainability (resolving environment, equity, and economics) and ecosystem design (green engineering) that expand the design capabilities of any one discipline. Maintain a studio space fostering openness and collaboration. The physical space of CSS promotes an inclusive and adaptable environment where interdisciplinary project teams work and meet. In addition to meeting areas and conference rooms, the CSS studio work space is an essential element for interactive and collaborative work. Work closely with community-based partners. CSS projects are developed through collaboration with local partners. Projects are subject to input and review by community members, local authorities, and other outside experts. Project teams are expected to engage these inputs and develop new ways to accomplish the multi-purpose goals of various projects and effectively represent these ideas to broader communities. Work in support of local, state, and federal initiatives. The CSS works closely with the Coastal Protection and Restoration Authority to innovate, implement, and extend the State Masterplan for a Sustainable Coast. In addition to CPRA the CSS works to engage other agency and funding opportunities.